Well, this is about the 5th attempt at working the Embossed Leaves pattern backwards (toe-up). It turns out that the lace as charted doesn’t do too well when worked backwards. Or at least it doesn’t look like leaves. I ended up swatching 1-1/2 repeats of the pattern so I could see what it was supposed to look like. Then I could turn it upside down and knit the actual appearance. Hopefully. The jury is still out on how well I did. I should know more in about 20 rows or so. I did follow the start-toe pattern backwards successfully. I sort of like the way it looks. I might use this toe again. Whether or not the leaves will flow down into the toe remains to be seen. 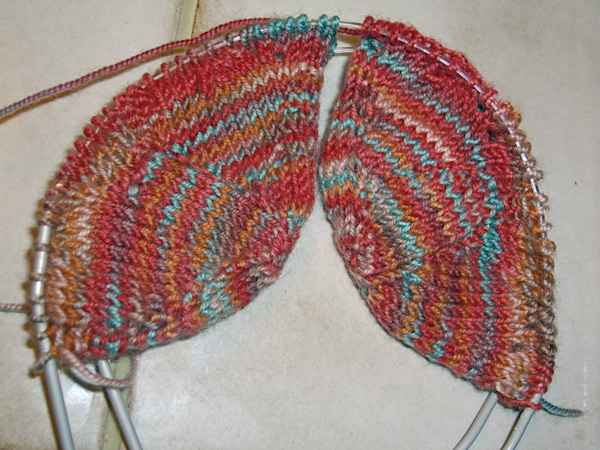 I’m not sure what I want to do with the heel yet. I might knit it as specified in the pattern, just for the heck of it. Who knows, maybe I’ll actually follow this pattern. Stranger things have happened. Oh… wait… I’m already not following the pattern because I started at the “wrong” end. Oops. [ed. 11:28 am PDT] For those of you who care (I know you care deeply! ), the yarn is Socks That Rock in colorway Red Rock Canyon. It appears that the blue is going to make a swirly spiral stripe around the foot. That might be cool. Last weekend my brother told me, I read your article in knitty.com. I really got the feeling that, if I knew anything at all about knitting, it would make sense and I’d be able to follow it and actually do something cool with it. But I want you to know that’s never going to happen. I do appreciate the compliment, which was very sweet. But, c’mon Bro… Men knit! Really! Got to see #1 Son for a brief while this morning. Later today he heads north for the second leg of the tour. Way north. Think good thoughts for road conditions. I have heard the as yet unmastered results from his regular band’s studio session a couple of weeks ago. They’re good. And I don’t think it’s just a proud mom talking, there.